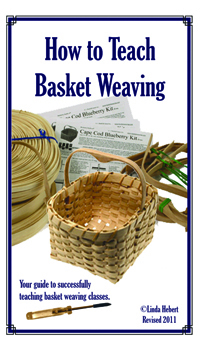 We have an excellent booklet by veteran teacher & designer Linda Hebert which covers everything you need to know to get started teaching Basket weaving classes. General teaching guidelines, class scheduling, suggested charges, materials lists, class size and so on. All sorts of information that you probably never considered (unless you're already a teacher!) is covered to help give you self-confidence and make even your first classes a success. This booklet proves that knowing how to weave baskets is but a small part of actually teaching the skills. Revised and updated 2011. How to Teach Basket Weaving by veteran teacher & designer Linda Hebert covers everything you need to know to get started teaching Basket weaving classes. General teaching guidelines, class scheduling, suggested charges, materials lists, class size and so on. All sorts of information that you probably never considered (unless you're already a teacher!) is covered to help give you self-confidence and make even your first classes a success. This booklet proves that knowing how to weave baskets is but a small part of actually teaching the skills.